A city-wide bike hire scheme could be set up in Leicester. Abdul Osman, Leicester City Council’s transport and regeneration chief, said the authority was planning to submit a bid to the Government for up to £10 million next month. If the bid is approved, racks of bikes would be set up across the city which people would be able to hire for short periods for a small fee – similar to the “Boris Bikes” scheme in London. The bid is likely to include a request for cash to create cycle routes and lanes and to improve existing lanes. The council is bidding to the Local Sustainable Transport fund. It will learn if it has been successful in April or May. The exact amount the council will ask for is to be finalised. “There’s a lot of scope – the cost could range from a few thousands pounds to several million,” said Coun Osman. Malcolm Hunter, of Leicester Friends of the Earth, said: “On the face of it this sounds like something we’d support. “If people are given feasible alternatives to using their cars then they’re likely to use those. Boris Bikes – officially Barclays Cycle Hire – has proved popular since it was launched in July last year, and is set to be expanded in time for the Olympic Games next year. 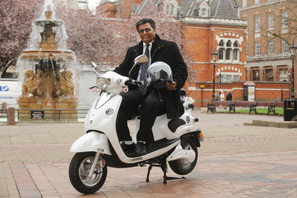 About 8,000 bikes will be available from 14,400 docking points at hundreds of locations. It is free to use the bikes for up to 30 minutes. Prices then rise from £1 for an hour to £35 for six hours. It will cost about £140 million over six years but the scheme is expected to eventually pay for itself. However, a scheme launched in January 2009 in Bristol ended after less than 18 months. Under Hourbike, anyone over 12 could rent bikes for any length of time from secure bike racks at “hubs” across Bristol. The scheme, partially funded by the city council but mainly operated privately, struggled as only 240 people signed up as members. Leicester City Council last month announced a pay-as-you-go car hire scheme which it hopes will cut the number of people who drive into the city. The authority is to work with rental firm Hertz on the car club, initially for a two-year trial period. If the scheme goes ahead this year, eight cars will be available for club members at four sites in the city centre.